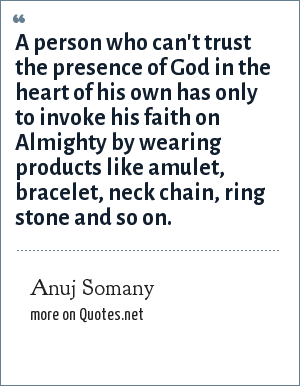 Anuj Somany: A person who can't trust the presence of God in the heart of his own has only to invoke his faith on Almighty by wearing products like amulet, bracelet, neck chain, ring stone and so on. A person who can't trust the presence of God in the heart of his own has only to invoke his faith on Almighty by wearing products like amulet, bracelet, neck chain, ring stone and so on. "Anuj Somany Quotes." Quotes.net. STANDS4 LLC, 2019. Web. 24 Apr. 2019. <https://www.quotes.net/quote/73964>.